These two gigantic, solitary statues of quartzite sandstone are the remains of the Temple of Amenhotep III, the largest Theban temple, which was once covering a total of 35 ha. The c. 17 m colossi once stood at the entrance of this temple complex. The twin statues depict Amenhotep III (18th dynasty) in a seated position, his hands resting on his knees and his gaze turned eastwards toward the River Nile and the rising sun. Two shorter figures are carved into the front throne alongside his legs. These are his wife Tiy (right) and his mother Mutemwiya (left). The side panels depict the Nile God Hapi. Despite of it’s huge size almost nothing remains of the Amenhotep III Temple. Built of mud bricks and not in blocks of cut stones, as was common in the 18th dynasty, and standing on the edge of the Nile floodplain, successive annual floods gnawed away at the foundations. Already during the Roman Period the only remains were the two colossi, which soon became a popular sight because of a strange phenomenon. One of the two statues, the northern one, made a sound at dawn: a light moaning or whistling. The sound probably caused by the air warmed by the sun passing through a crack in the statue, formed by an earthquake in 27 BC, was attested to by hundreds of inscriptions. The sound disappeared after the restoration of the monument in 2nd century AD. The mortuary Temple of Ramses III (20th dynasty) at Medina Habu is a huge complex. It is the best-preserved Theban monument, surrounded by a massive mud brick enclosure, which may have been fortified. Just inside the enclosure, to the south, are chapels of Amenirdis I, Shepenupet II and Nitiqret, all of whom had the title of Divine Adoritrice of Amun. It was once also a place of worship, as well as a fortress and administrative centre for Thebes which spanned several dynasties. Aside from its intrinsic size and architectural and artistic importance, the temple is probably best known as the source of inscribed reliefs depicting the advent and defeat of the Sea People, during the reign of Ramses III. The colour of its bas-reliefs is still intact. The site of Ramses III’s mortuary temple was sacred long before his time and is still regarded as having magical powers by local farmers. About 4 km south of Medina Habu on the road to Armant, you’ll find a small temple of the goddess Isis, built by the Romans. The structure consists of a propylon gateway decorated with deeply carved reliefs by the Emperors Galba, Otho and Vespasian, who appear before various deities. A large court, which no longer exist, was once surrounded by walls, but there were remains of a doorway bearing a cartouche of Caesar at the centre of the court. A well was built in the north-west corner of the court. The main temple structure is usually kept locked. The visitor has to be content with peering through a grill covering the doorway into the dark interior. This consists of a narrow hall and a sanctuary, decorated by Emperors Hadrian and Antonius Pius, surrounded by six small chambers and a staircase to the roof. The decoration includes interesting reliefs and inscriptions concerning rituals of the deities acknowledged during the Roman Period, at a time when many of the old rituals were becoming difficult to understand. In the middle of the village of Kom Lolla, not far from the entrance to the temple of Ramses III at Medinet Habu, is a tiny Temple of Thoth, which was constructed by Ptolemy VIII, (Euergetes II). The temple was also dedicated to the ancestors of the Ptolemaic pharaoh. The structure of the temple is very simple. It has a small forecourt leading to three chambers. In the first hall there’s not much to see, but the entrance door to the second hall depicts the titles of Ptolemy and Cleopatra II. Scenes in the second hall show the king offering before various deities. The sanctuary behind shows the king before deities although much of the decoration is difficult to make out. The reliefs here depict Ptolemy making offerings to some of his ancestors, Ptolemy V and Ptolemy VI with their queens. Ptolemy 8 can also be seen receiving the heb-sed symbol from Thoth. The northern wall of the sanctuary depicts the king opening a shrine containing Thoth. The rear wall shows him making offerings of ritual objects to many different (some lesser known) deities. The ceiling shows the goddesses of the north and south, Nekhbet and Buto as vultures. The temple is usually kept locked, but the visitor can ask in the village for the guardian who has the key. The Temple of Seti I is the most northerly of the Theban temples and situates just past the road to the Valley of the Kings. Seti I (19th dynasty) dedicated the temple to his father Ramses I and the god Amun. Seti encouraged art and architecture, and his temple hold some of the most exquisite relief work in the entire Nile Valley. Of the original length of some 158 m only about 47 m of the temple remain, mostly the area containing the sanctuary, Its halls and ante-chambers. Most of the frontal courts and pylons are in ruin but because of the murals and the relief art work on the walls and ceilings, a visit is immensely worthwhile. Deir el Medina is one of the best preserved ancient settlements in Egypt. 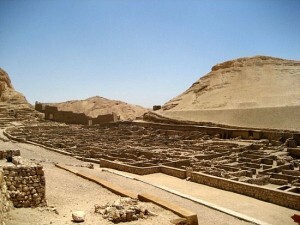 It is also known as the ‘Workmen’s Village’, the community of artisans who were employed in the construction of the royal tombs and other monuments of the Theban necropolis during the New Kingdom. Together with their wives and families the workmen occupied the neatly constructed housed of mud brick and stone for some 450 years during Egypt’s New Kingdom. The settlement was founded sometime early in the 18th dynasty, although by which king remains uncertain. Many bricks in the settlement’s enclosure wall were stamped with the name of Thutmosis I (18th dynasty), who was the 1st pharaoh to be buried in the Valley of the Kings. However the reverence was given to the previous king, Amenhotep I (18th dynasty) and his mother, Ahmose-Nefertari, which indicates that they might have been instrumental in setting up the royal workforce at Deir el Medina. Deir el Medina is situated in a small secluded valley in the shadow of the Theban hills, on the West Bank of the Nile. The location is unique for its unrivalled wealth of archaeological, artistic and textual evidence that has survived during the years and which helps us to understand many aspects of the daily lives of its ancient inhabitants. It was also the site of several known temples dating up to the Ptolemaic Period. This is the largest of the temples which extant today, dating from the Ptolemaic period. The building itself is small and is lying within a mud brick enclosure wall. The temple was built and decorated in the 3rd century BC. The work was started during the reign of Ptolemy IV Philopator (222-205 BCE) and then was continued for the next 60 years under Ptolemy VI Philometor (180-164 BCE) and Ptolemy VIII Euergetes II (145-116 BC). The gate into the enclosure was added by Ptolemy XIII Neos Dionysos, who is also depicted on the lintel in the entrance to the columned hall. A narrow vestibule beyond, decorated by Ptolemy VI Philometor, has a staircase on the left-hand side which leads up to the roof. The vestibule is beautifully decorated with floral columns and Hathor pillars in a very well-preserved condition and still with much colour. A column to the left-hand side of the doorway of the vestibule depicts the deified Imhotep with his mother and wife and on the right shows the deified Amenhotep, son of Hapu. The vestibule has three doorways leading to three sanctuaries dedicated to Hathor as the local goddess of the Theban centre, Amun-Sokar-Osiris representing the underworld (left) and Amun-Re-Osiris as a solar god (right). The reliefs in each of the sanctuaries, showing the king offering to a wide variety of deities, are very well-preserved and have recently been cleaned to show their colours. In the sanctuary of Amun-Sokar-Osiris there is a relief showing a judgement scene where the heart is being weighed – usually only seen in tombs. Another scene from this sanctuary shows the four-headed Ram of Mendes who represents the four winds. Opposite the Hathor temple, across the valley to the east, remains of a temple to Amun and the other members of the Theban triad (Mut and Khonsu) stand. The temple was built by Ramses II (19th dynasty). The temple consisted of a forecourt, outer and inner halls, pronaos and sanctuary. Scant remains of a temple can be seen on the hillside immediately to the north of the Ptolemaic temple enclosure. This temple was dedicated to Amenhotep I (18th dynasty) and his mother Ahmose Nefertari, who were both deified The temple consisted of an outer and inner hall, pronaos and shrine. Two steps led into the pronaos which had been decorated with a wall-surround of red, white and black horizontal bands. by the villagers. The original structure was a small one and little remains of it. Many of the walls surrounding the site are later accretions. The number of votive chapels and shrines dedicated to various deities by the community of workmen at Deir el Medina indicates their devotion, tolerance and need for public religious expression. Any individual chapel would have provided a local residence for the god or goddess to whom it was dedicated and an area for offerings to that deity. The chapels symbolise the community’s recognition of both local and national gods. The main cemetery of the royal workmen at Deir el Medina is situated to the west of the village, on the slope of the Theban hills. Most of the tombs were built during the 19th dynasty. Some of them are impressive in their decoration and size. By the time of the 20th dynasty the tombs had been turned into family tombs in which the descendants of the original owners were buried. A number of the tombs are still in an excellent state of preservation. Their decoration boast vivid colours against a rich yellow background possibly suggesting the colour of papyrus. 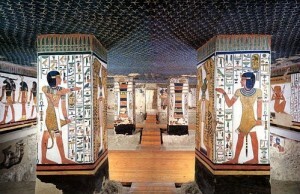 The themes of the decorated walls are not scenes of daily life or funerary ceremonies but instead are devoted almost exclusively to texts and scenes from the Book of the Dead, borrowing from the same repertoire of religious scenes that appear on the walls of royal tombs in the Valley of the Kings. 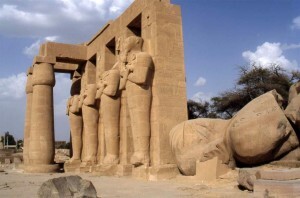 The Ramesseum is the memorial temple or Ramses II (19th dynasty). It is perhaps the most captivating and elegant monument in Thebes. The temple was dedicated to the god Amun and the deceased king. Although is it has been victim to the ravages of time and of man, the Ramesseum is extraordinarily fascinating. The remains of the complex include a royal palace and a large number of mud brick granaries and storerooms. The walls of the Ramesseum are decorated with reliefd, including scenes depcting the Batlle of Kadesh, the Syrian wars and the Festival of Min. 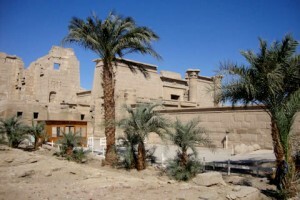 Also a small temple still exist, dedicated to Ramses’ mother Tuya and wife Nefertari. Merenptah (20th dynasty) was the son of Ramses II. His mortuary temple was in a highly ruinous condition, but was excavated and restored and is now a fascinating site accompanied by a small but excellent museum. In the glass cases of the museum you’ll find, among other interesting things, a collection of small moulds that were fond in the temple, which the ancient Egyptians used to make beads for necklaces and other jewellery. Deir el Bahari, literally meaning ‘The Northern Monastery’, is a complex of mortuary temples and tombs. Three temples where built here, arranged one at the side of the other and belonging respectively to the pharaoh Mentuhotep Nebhepetre (11th dynasty), Thutmosis III (18th dynasty) and Queen Hatshepsut (18th dynasty). Mentuhotep (11th dynasty) was the first known king of Theban who built a whole mortuary complex, which included his tomb. The temple’s architecture was unique for the period. It was built on a multi-level platform, which combined the elements of the earlier saff-tombs and the traditional Old Kingdom pyramid complex. Little is left of this structure, however. The temple of Thutmosis (18th dynasty) was constructed of both sandstone and limestone and dedicated primarily to the god Amun, both in the form of Amun-Re and Amun-Kamutef. Its ancient name was (Amun)-Djeser-akhet, meaning ‘Holy of Horizon’. Nearby a chapel was built to honour Hathor as well. Probably there was no mortuary cult of the king at this temple. Thutmosis III had another temple built a short distance away, the funerary temple Henkhet-Ankh. Small in size compared to the other complexes erected earlier at Deir el Bahari, the temple is located on a small elevated terrace to the immediate north-west of the funerary temple of Mentuhotep Nebhepetre, and therefore positioned tightly between it and the temple of Hatshepsut immediately to the north-east. The larger part of the temple is positioned above the level of the upper terrace of the temple of Hatshepsut and rests on a roughly square platform partially cut from the rock and partially constructed of loose stones, supported by a stone revetment. This elegant monument is located in the foothills of the Theban hills and is a masterpiece of Theban architecture. The temple rises out of the desert plain and consists of three imposing terraces and merges with the sheer limestone cliffs that surround it. The two lower terraces would have been once full of trees. The temple was built for the great Queen Hatshepsut (18th dynasty), to commemorate her achievements and to serve as a funerary temple for her. Hatshepsut was a rare female pharaoh. Modern Egyptologists call her the most successful pharaoh, ruling longer than any female ruler of an indigenous dynasty. She is regarded variously as the earliest known queen regnant in history, the first female pharaoh and the first great woman in history, although all of these claims have been contested. Hatshepsut was the daughter of pharaoh Thutmosis I and the wife of this successor Thutmosis II. She was a prolific builder, commissioning hundreds of construction projects throughout both Upper and Lower Egypt. Under her reign, Egypt’s trade networks began to be rebuilt, after their disruption during the Hyksos occupation during the Second Intermediate Period. Thoth Hill, is located off the beaten track of the ancient necropolis on its north-western edge. The hill rises to the north of the Valley of the Kings as high as c. 460 m above sea level and it constitutes the highest peak of the Theban limestone massif of Gebel. Thoth Hill is the site of two temples, an archaic temple that may date to around 3,000 BC and would be the oldest temple built on the West Bank at Luxor, and built upon it, a later temple built by an 11th dynasty pharaoh known as Sankhkare Mentuhotep. The area is somewhat difficult to reach. The hill is surrounded by desert ravines and the ancient route leading up to the temple is difficult to ascend. To visit the remains a local guide is necessary. 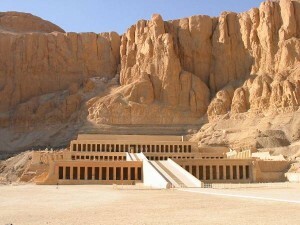 The burial place of the great Pharaohs of Thebes, who hoped to meet their Gods in the afterlife. This valley consist of hundred of tombs displaying the religious life in ancient Egypt through the inscriptions and scenes carved on the walls and the ceilings of the tombs. It is one of the most remarkable archaeological sites of the world. The Theban Necropolis also has tombs for the favourite nobles and the wives and children of both the nobles and pharaohs. With 120 known rooms and excavation work still underway, it is the largest tomb in the valley. The Valley of the Queens lies at the southern end of the necropolis. This is where from ca. 1300 BC the queens and their children were interred, although some wives were still buried with their husbands. This burial ground contains somewhat 57 tombs including the most splendid and outstanding tomb of Queen Nefertari. This last tomb however was closed for visitors in 2003 for an indefinite period, in order to investigate the condition of the painted walls which are thought to be deteriorating. The West Valley has only one tomb open to the public: the tomb of Ay, Tutankhamun’s successor. There are a number of other important burials there, including that of Amenhotep 3, but these tombs are still being excavated and are not publicly accessible. Take a hot air balloon flight over the Nile River’s west bank. Enjoy the unbeatable views and the tranquillity of the early morning sun rising over the east bank, illuminating the city and mountains, as you gently rise into the dawn sky. Karnak Temple is greeting the morning sun in the East, while the magnificent Hatshepsut Temple is sitting adjacent in the West. 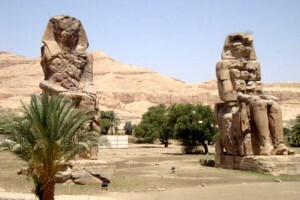 The Colossi of Memnon rise from the midst of crop fields. In distance the hidden Valley of the Queens rest peacefully in the mountains, while below the farming villages begin to wake and begin the day. Flying in an air balloon is really an unforgettable experience. To sit on the back of a camel and merge with the beauties of the land is entertaining for all ages. The rides with a guide continue generally for an hour of two. The guide takes you on your ride around the most important attractions on the west bank, along the Nile and through the fields. A camel ride is very interesting, especially if you ride a camel for the first time. Its great fun and a fairly comfortable ride as long as you remember to lean back when the camel stands up and again when it sits down! Enjoy the majestic region of the west bank by donkey back and connect with the local people. Or take the donkey ride over the ridge on the west bank. You’ll never regret it! It is an amazing experience in the steps of the workman, that built the tombs on their daily commute from their homes at Deir el Medina on one side of the mountain to the Valley of the Kings on the other side. It is good fun. A must for everyone who loves to ride a horse. If you want to make a quite ride or a more adventurous one, a horseback ride is suitable for every rider level of training and that for one or more hours. Just take the opportunity and the freedom and ride on an Arab horse through palm groves and sugar cane fields, along the Nile or through the desert and watch the colourful play of the sunset. Enjoy the beautiful wild nature, the country life with the farmers working in the field, the typical Egyptian villages and connect with the local people. Riding a bike is a great way to get around and to explore the west and east bank of the Nile, especially in winter time. So, rent a bike for a spectacular day of self-guided touring. Ride a bicycle through the city and it’s temples for an unforgettable, unique sightseeing experience. See all recommended sites and Luxor’s historical and breathtaking landmarks or just enjoy the wind through your hair, when cycling along the Nile and through the fields. Footpaths connect the sites on the west bank. Many are the same ones taken by ancient craftsmen on their way to work or by priests and guards who made tours of inspection of the temples and tombs. Several routes climb over the Theban Hills and offer outstanding views of the monuments and the emerald green Nile Valley. None of the paths is particularly difficult – they are uphill walks rather than hikes – and most can be made in less than two hours. The shortest and easiest of the walks is between the Valley of the Queens and Deir el Medina (and should be made in that direction, not the reverse, because there are fewer hills to climb). If you want to do something totally different you can go for the ultimate adventure and go for a few hours off-road quad biking across the Egyptian desert and discover the beauty of the sun rise or sunset. Quad biking is an awesome activity, where one can enjoy maximum off-road fun! Experience the gush and thrill of adrenalin while driving to the loose sand, muddy banks and steep dirt trails.